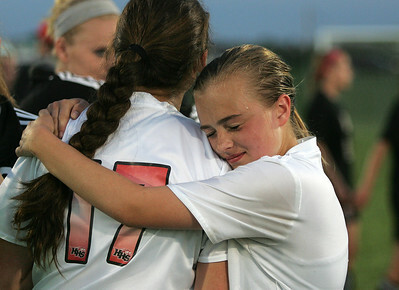 Kyle Grillot - kgrillot@shawmedia.com huntley freshman Alyssa Kaufman (right) comforts senior Crystal Hoffman after losing to Barrington in the girls regional soccer game at Jacobs high school Tuesday. 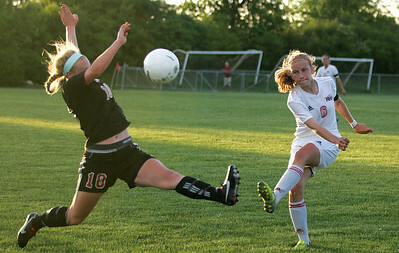 Kyle Grillot - kgrillot@shawmedia.com Huntley junior Abigail Nordeen kicks the ball past Barrington senior Molly Pfeiffer during the second half of the girls regional soccer game at Jacobs high school Tuesday. 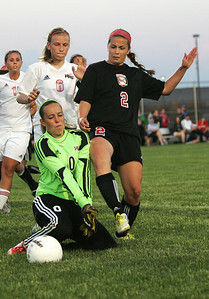 Kyle Grillot - kgrillot@shawmedia.com Barrington senior Alexa Dargis kicks the ball past Huntley sophomore goalie Kelli Rubinoduring the second half of the girls regional soccer game at Jacobs high school Tuesday. 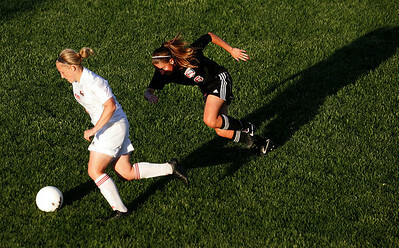 Kyle Grillot - kgrillot@shawmedia.com Huntley sophomore Deanna Hecht moves the ball downfield against the defense of Barrington senior Meredith Slott during the first half of the girls regional soccer game at Jacobs high school Tuesday. 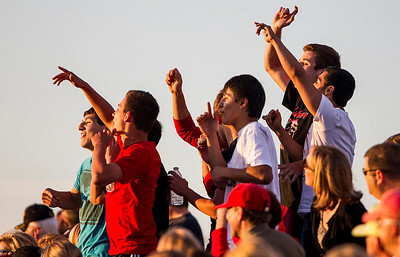 Kyle Grillot - kgrillot@shawmedia.com Huntley Fans cheer on the team during the second half of the girls regional soccer game at Jacobs high school Tuesday. Kyle Grillot - kgrillot@shawmedia.com Huntley junior Beth Parks fights to control the ball against the defense of Barrington junior Alex Avers during the second half of the girls regional soccer game at Jacobs high school Tuesday. 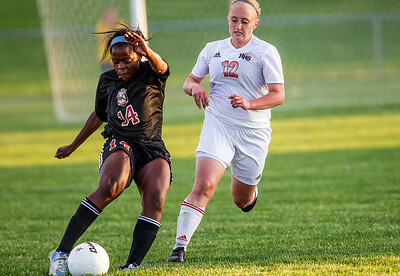 Kyle Grillot - kgrillot@shawmedia.com Huntley sophomore Deanna Hecht loses control the ball against the defense of Barrington junior Gabby McLaurin during the second half of the girls regional soccer game at Jacobs high school Tuesday. Kyle Grillot - kgrillot@shawmedia.com Huntley sophomore Katie Constantino (center) fights to control the ball against the defense of Barrington seniors Annalise Avers (left) and Emily Morin during the first half of the girls regional soccer game at Jacobs high school Tuesday. 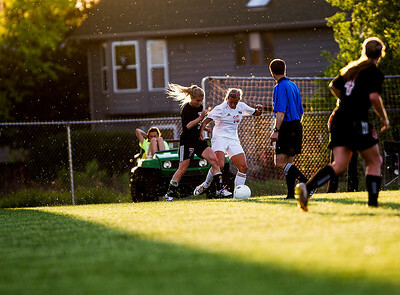 Kyle Grillot - kgrillot@shawmedia.com Huntley junior Abigail Nordeen chases down Barrington sophomore Kelsey Muniz during the second half of the girls regional soccer game at Jacobs high school Tuesday. 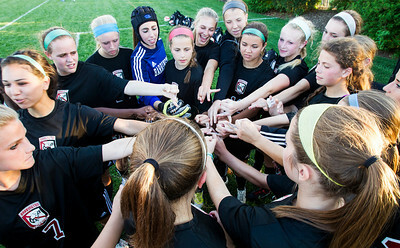 Kyle Grillot - kgrillot@shawmedia.com Barrington soccer players huddle together during the half time of the girls regional soccer game at Jacobs high school Tuesday. 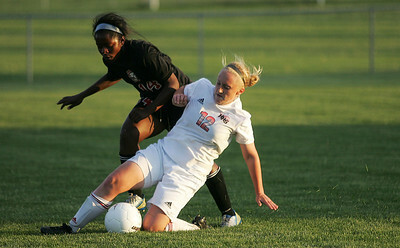 Kyle Grillot - kgrillot@shawmedia.com Huntley sophomore Deanna Hecht slide to control the ball against the defense of Barrington junior Gabby McLaurin during the first half of the girls regional soccer game at Jacobs high school Tuesday. 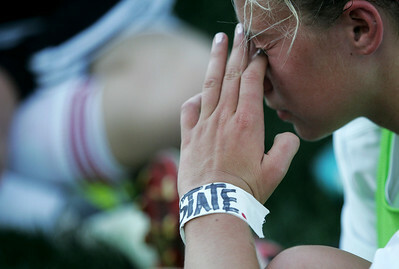 Kyle Grillot - kgrillot@shawmedia.com Huntley junior Beth Parks listens to coach Kris Grabner during the half time of the girls regional soccer game at Jacobs high school Tuesday. 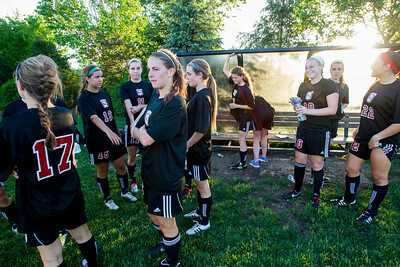 Kyle Grillot - kgrillot@shawmedia.com Barrington soccer players gather around the bench during the half time of the girls regional soccer game at Jacobs high school Tuesday. 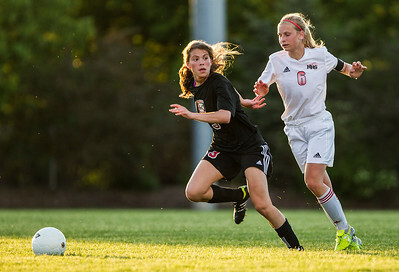 Huntley sophomore Deanna Hecht moves the ball downfield against the defense of Barrington senior Meredith Slott during the first half of the girls regional soccer game at Jacobs high school Tuesday.